Where can you get an employee that works for less than $5 an hour? Give us a call. We can make that happen. Isotec’s Two-Lane DHS Designated Safety Entrances® cost $49,170. With proper maintenance, our Safety Entrances® have service lives of 10 – 25 years. Over 5 years that’s a $4.92 cost per hour based on an 8 hour day, and only $3.78 per hour for a 10 hour day. 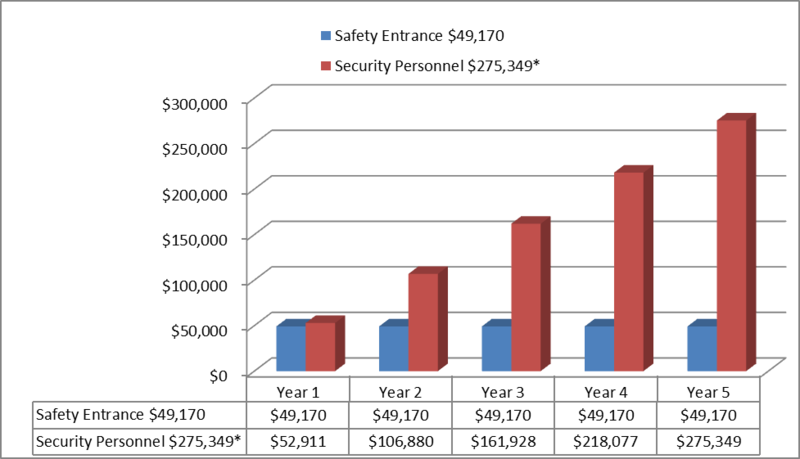 As the chart below shows our Safety Entrances® pay for themselves 5 times over when compared to a more traditional security guard service. The economic advantages of automation vs. manual boots on the ground is a one-time firm fixed price vs. spiraling inflationary costs incurred with a “Security as a Service” model. Our Safety Entrance® Mantrap Security Doors are also more effective than even the best of guard services for screening and denying entrance to anyone trying to enter a building with an unauthorized firearm. Isotec’s entrances are programmed for screen and search objectivity to stop unauthorized weapons from entering your facility. Objective screen rules combined with pre-programmed scenarios of operation insure that our entrances will perform the same way 24/7 regardless of location. In other words, unlike the human tendency, judgment calls are not a factor. Our entrances are also utilized to prevent tailgating, whereby two people try to enter a building using only one credential. Our exits are designed and configured to prevent exit only breaches from occurring, whereby someone attempts to enter your facility while others are leaving. In addition to being more economical and thorough at safeguarding your entrances; since 2010, Isotec’s Safety Entrance® mantraps have carried the Certificate of Designation by the Department of Homeland Security as Qualified Anti-terrorism Technologies. The certification process from Homeland Security vetted not only Isotec’s products, but processes and procedures for manufacturing standards and product development practices. Can you say that about the armed guard standing in your lobby? Contact us today for more information. This entry was posted in Access Control, Active Shooter, Anti-Terrorism, Banks & Credit Unions, Commercial Facilities, DHS, Isotec Security, Safety Entrance, Security Guards, Security Monitoring and tagged Access Control Vestibules, Anti-terrorism Technologies, automated security, Department of Homeland Security, Door Metal Detector, Weapons Detection. Bookmark the permalink.